by Michael Eggleston* (Advanced Biofuels USA) On October 9th the 10th European Forum for Industrial Biotechnology and the Bioeconomy kicked off in Brussels, Belgium, giving participants the opportunity to take part in a stakeholder workshop held by the European research project COSMOS which aims at reducing the dependence of imported plant oils such as palm kernel oil (PKO) by transforming short seasoned feedstocks, camelina and crambe, into profitable, sustainable, multipurpose, non-food, non-transgenic oil crops. 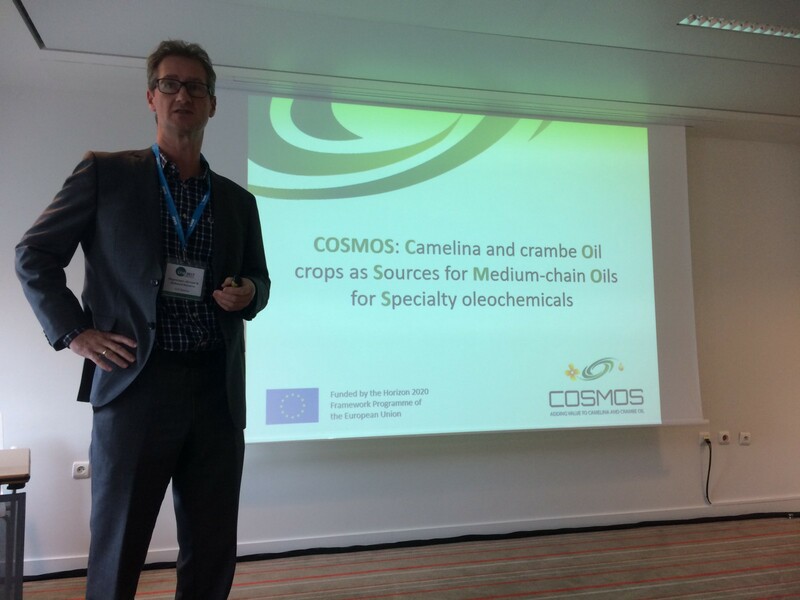 COSMOS is an outcome of the significant progress that has been achieved regarding the development of a bio-based economy in the EU thanks to programs like Horizon 2020 and, if successful, could serve as an example to other vegetable oil feedstocks, says project coordinator Dr. Rolf Blaauw. Produced in a handful of developing countries, PKO exports have left the European oleochemical industry skeptical about the assurance of market stability in the coming years as the demand for products such as soaps, detergents and biofuels are on the rise. According to a 2008 study conducted by ETH Zürich , at least half of all oil palm plantations established in Indonesia and Malaysia, the world’s top producers, were opened at the expense of tropical forests contributing to the rise of global greenhouse gases (GHG)) and with a detrimental impact on Southeast Asia’s biodiversity as deforestation continues to grow in order to meet the world’s growing markets. Over the past 3 years for a 4.5 years project, a team composed of 18 partnerships between research institutes, universities and industries has been leading the way in developing a solution that could revolutionize the future of the oleochemical industry thanks to an evolutionary trait discovered in bacteria. Utilized as a breeding technique to inactivate undesirable plant characteristics, CRISPR/Cas9 has paved the way to improve the seed oil quality of oil crops camelina and crambe during preliminary studies conducted by the team in the Wageningen University in the Netherlands. Not only do these feedstocks have the potential to produce high value oils, but they can also be grown over a range of environments stretching from Poland and the Netherlands to Italy and Greece, with several cultivation techniques, and also on marginal lands where they have superior durability compared to commonly grown crops such as rapeseed that require much more maintenance. To encourage a fully sustainable lifecycle in the scope of Europe’s circular-based bio-economy, vegetative tissues such as straw, leaves and press cake can be fed to insects that produce high-value proteins and fats that can be sold back to farmers as feed for livestock. Genetic modification is needed in order to initially introduce the mutation to the crop but does not remain in the mutant product. So although CRISPR can enhance plants more efficiently and precisely than traditional random mutation breeding, mutants could be considered a Genetically Modified Organism (GMO) subject to strict regulations. As of September 2017, the European Commission (EC) had not taken a stance as to whether CRISPR should necessarily be seen as a standard mutation breeding technique or should be regulated as GMO under regulations which could seriously limit the success of the project. In order to assess part of the sustainability of the COSMOS project, a socio-economic assessment (strength, weakness, opportunity, threat (SWOT) analysis) was conducted byby Dr Rocio Diaz-Chavez, from the Imperial College London who is leading the socio-economic assessment, after the project was introduced to participants representing the general public who were paired with stakeholders representing the various affiliations responsible for developing the work packages of the project’s full value chain. The project team was mainly concerned with how their credibility would be accepted by the general public as an incentive to reduce the dependence of imported oils utilizing GM to improve oil content in alternative crops and how their life-cycle approach to utilizing extracted proteins and fats from insects would be taken. The group I joined discussed that the project definitely served to have credibility which would encourage the economic development of the EU’s plan to become a bio-based economy despite the fear of new diseases possibly arising from the uptake of extracted insect proteins. Also, this might disrupt traditional supply chain relationships with countries like Indonesia and might increase the market price of such oils since bringing production closer to home would require the employment of higher wage jobs. Although there was some skepticism to predicting exactly how these developments might play out in the future, it is still clear that CRISPR/Cas9 has not been accepted by EU regulation. Still, much more research is needed to obtain more detailed knowledge of yield in full crop cycles as well as its potential profitability. According to Dr. Robert van Loo who is leading the project’s genetics component, the cost of cleaving the genetically modified fatty acid into smaller more valuable pieces is of main concern to developing an economical package they could present to the EC in the future. As reported in August’s issue of Industrial Biotechnology Magazine in an article labeled ‘A Conversation with Vonnie Estes’, in order for the industry to successfully commercialize more sustainable products in the future there is a need for better communication and more transparency with consumers who distrust the Big Food industry, says the CEO of Estes Advisors. Presentations from COSMOS Stakeholder Workshop, Brussels, October 9, 2017. Chemical engineer advocating for the adoption of advanced biofuels as a climate change mitigation and pollution control solution.